A big expanse of lush, green grass pleases the human eye and spirit, and outdoor spaces tend to provide relaxation, recreation, enjoyment and comfort. For these and other reasons, landscapers, contractors, park managers, golf course patrons, ground crews, homeowners and others invest tremendous effort and expense in creating a flawless lawn. Warren CAT understands the quest to create the perfect lawn for your clients, and all of the different pieces of landscaping equipment that can help get the job done right while increasing your productivity, efficiency and profitability in the process. The right equipment also creates new capabilities that may enable companies and contractors to win additional landscaping jobs. Achieving your client’s dream landscape or lawn arrangement is difficult and time-consuming without the right equipment and tools. Landscaping equipment and tools make reaching your client’s goal simpler and increase productivity and efficiency, while reducing your project’s overhead costs. Maximize your project’s efficiency throughout every step of the process. Landscaping work tools are invaluable during site preparation, and even during maintenance, for removing vegetation such as old turf, persistent weeds and junk trees, as well as stumps and big rocks. Some sites look like a jungle at the start of the project, while others may not be as problematic. Skid steer loaders are compatible with a variety of attachments, but for removing vegetation, their go-to attachment is a brush cutter. Built for performance, reliability and safety, skid steer loaders provide the power you need to run your brush cutter at optimal performance to achieve faster cutting and quicker project turnaround times. Their versatility also allows you to use them for other project tasks. Brush cutters are the ideal attachment for removing vegetation and brush when preparing a site for a new project, such as clear-cutting a recreational area, or maintaining a site, such as a highway median. With several available cutting widths, they make it easy to clear large sites fast. Attach a brush cutter to a skid steer loader for the best, most efficient results. Small and mini excavators offer the power and performance to make your project productive and efficient when removing large stumps and rocks. Smaller-sized excavators are convenient when working in narrower areas, such as residential locations. Excavators can also dig deep enough to ensure root removal, which prevents regrowth, as well as dissatisfied clients. Small dozers are built for smaller jobs such as residential work. They are a viable alternative to using excavators for stump removal, as dozers have the horsepower to remove large stumps with ease. Small dozers have multiple other uses, such as clearing and grading lots. Preparing and maintaining lots can be a time-consuming drain on your resources. Landscape equipment, however, provides a solution for faster and more cost-effective brush and debris removal using hardware that is durable and reliable. Grade your debris-free site using compact landscaping equipment for fast and effective results. You will want to assess the location ahead of time for any drainage issues, hills, valleys or other imperfections, such as steep slopes. A backhoe’s main purposes are trenching, backfilling and moving materials. Improve your productivity with an advanced hydraulic system that delivers precise operating and handling features. Backhoes can also travel up to 25 mph, allowing you to move and shift soil across large construction areas quickly. Attach trenchers to backhoes for better trench cutting. Trenchers cut straight and narrow trenches for electrical, telephone and cable lines, as well as piping for water and gas service. Manually digging trenches is time-consuming and decreases your team’s output. Trenchers are a smart choice, and they feature several cutting widths to accommodate any job. A small dozer’s primary purpose is grade work. Dozers can slope the sides of roads, as well as assist in the final grade work for driveways and landscapes. Unlike over equipment, small dozers are designed to offer unparalleled accuracy for finish grading. Our rental dozers can be equipped with AccuGrade™ Grade Control System to help you grade your site right the first time, saving your team hassle later. Your site’s finished grade should be even with patios, walkways and other landscape features, and you should leave room for additions like fine-quality topsoil, lime and fertilizer. If your landscape contract is residential or commercial, your client may ask you to treat the soil for grass seeding, or the planting of shrubs and trees. Soil amendments — which can include lime, sulfur, weed prevention and other organic materials — are developed and used when tilling the ground. Compact track loaders and tillers are commonly used machines and attachments for filling. Compact track loaders offer versatility, traction and stability for tilling soil. Their suspended undercarriage is also a bonus because it minimizes ground disturbance and provides extremely low ground pressure. Certain compact track loaders feature an electronic torque system to manage the loader’s torque and maximize its performance and production. Tillers break up and pulverize soil, which allows soil treatments to mix-in and do their job. Spiral tillers improve cutting performance by 10 percent in comparison to tillers with standard placements. Tines with tungsten offer exceptional strength, durability and longevity. Make your soil amendment process efficient with equipment that’s built to last and drive results. Soil amending can be a quick and easy process with the right tool, such as a compact track loader with a tiller attachment. Tilling with smaller equipment is an inefficient method, and will only extend your project’s completion date. Landscape rakes feature hardened teeth and use a scarifying action to collect rock and debris, which are then deposited into a hopper bucket. Rakes are attached to compact track loaders and will aerate, level and condition soil. They also are available in several widths, allowing you to cover large areas quickly. There are several types of blades designed and built specifically for landscaping. Landscaping blades assist in leveling soil after raking, but also for grading soil. Rollers and compactors pack-down soil to prepare it for planting and seeding. Rollers ensure that the soil will compact at the right amount, which allows grass seed to fall into the soil and germinate. Use landscaping attachment equipment to reduce your work time, as well as increase the accuracy and quality of your work. You’ll leave clients with a positive impression, and their recommendations will benefit your company in the long-run. Plant vegetation such as shrubs and trees with durable landscaping equipment to finish the last step of your landscaping project. We recommend a few tools for planting vegetation, especially for larger greenery, such as trees. Handle pallets of fertilizer and sod using a fork attachment. Fork attachments are used with loaders and backhoes. Unload sod and fertilizer faster with a fork attachment. Delivering the pallets throughout your work area will save you time compared to manually unloading the materials. Use an auger to quickly drill holes for fencing, trees, shrubs and other hardware. Augers are designed for maximum productivity through an optimum balance between speed and torque. Auger bits range in size so they can reach any landscaping project’s depth. Landscaping equipment like forks and augers can simplify your tasks and increase your team’s production. A quicker project pace allows you to take on more projects throughout the year and potentially raise your company’s profitability. While landscape equipment and accessories make projects easier, many contractors raise concern over the cost-prohibitive nature of owning an extensive lineup of equipment and accessories. Rentals are becoming the go-to option for many professionals in the landscape industry. Renting instead of buying equipment or and attachments is affordable and offers all the benefits of owning the items. Use of the newest hardware. Rentals let you use the latest hardware and technology in the construction industry, without the significant financial investment of an equipment purchase. Access to maintenance and support teams. Certified and highly trained technicians repair and maintain Cat equipment throughout Texas and Oklahoma. Product support is also available 24/7, as well as emergency technical support. Save your time and money by avoiding the need to pay for maintenance, repairs or halted projects due to machine failure. Rental of short-term use equipment. Landscape projects can require equipment you may not have in your inventory. Renting equipment, however, can let you take those jobs without buying equipment or attachments that your company does not need for daily operations. Reduced costs compared to equipment purchases. Equipment and attachment rentals are often more cost-effective, especially if the hardware is only for one project, in comparison to purchasing or financing equipment over a set number of years. Availability of daily, weekly and monthly rentals. Equipment and attachment rentals are available in varying durations to fit your project’s estimated timeframe. At Warren CAT, we offer daily, weekly and monthly rentals, as well as longer-term rental durations. Rent-to-own and lease options. Rent-to-own agreements allow you the opportunity to rent equipment, typically for six months, and then choose to purchase the equipment after that timeframe. You can often use your completed rental payments as a down payment. Leasing options assist in longer-term projects, extending over a year, and can include a purchase or renewal option at the end of the agreement. Landscape equipment rentals are a convenient and cost-effective alternative to purchasing new equipment. At Warren CAT, certified technicians service and test our rental equipment regularly. We also offer easy ordering and delivery, as well as expert advice on choosing equipment that fits your individual project or contract’s needs. Cat landscaping equipment and attachments expedite the creation of perfect lawns and landscapes. These multi-capable machines save hours upon hours of manual labor. Backhoes provide the dual and versatile ability to do tasks from both ends, and the extent of what they can do may depend on the attachments chosen. Backhoes are typically used for digging — for example, trenches for irrigation or drainage — but they can also carry loads, level soil and perform various other tasks. New Cat backhoes offer digging depths ranging from 14 to 17 feet, allowing for a broad range of trenching capabilities. Mini excavators allow for close radius maneuvering and digging, which permits a wide range of landscaping activities in tight spaces. Excavators are well suited to dig trenches for drainage or irrigation systems, especially in places a backhoe would not be able to reach. You can also outfit your mini excavator with a variety of attachments including augers, thumbs, compactors and buckets. Skid steer loaders usually roll on rubber tires, so they are a preferred choice when the work involves travel on concrete, asphalt, curbs, sidewalks or other paved surfaces. Skid loaders can be equipped with multiple attachments to dig, carry, smooth and grade soil. Compact track and multi-terrain loaders are fitted with a rubber undercarriages that minimize ground disturbance with extremely low ground pressure, making them a great option for jobs with preexisting lawns. Like skid steer loaders, they can be equipped with a multitude of landscaping attachments to ensure maximum versatility and productivity. Telehandlers (also called variable-reach forklifts) are multipurpose machines with attachments, such as carriages and buckets, to help load, carry and place materials. The telehandler’s reach enables contractors to lift wall bricks into place or lay sod without having to walk on or touch the material after placement. Cat telehandlers offer lift heights ranging from 42 to about 55 feet. 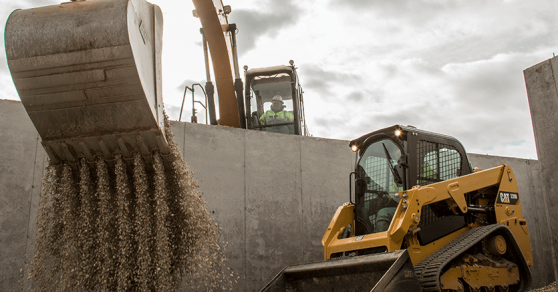 Compact wheel loaders feature improved fuel economy and reduced emissions, while still maintaining their high performance, versatility and precision. Attachments for compact wheel loaders can be changed out in as little as 30 seconds to keep projects moving. Compact wheel loaders are great options when you need larger bucket capacities than available with a skid loader. Small dozers optimize finish grading accuracy and are ideal for residential construction jobs. In addition to final grade work, small dozers can also clear and grade lots, slope roadsides, and back-fill. The deciding factor for some contractors when it comes to which type of main machine best suits their business can be what assortment of landscaping attachments and accessories it accepts. Augers dig precise holes for trees and shrubs, as well as fence-post holes, deck footings and many types of playground foundations and supports. They come in different sizes and can be programmed to dig to a specific depth so that all the holes are uniform. Augers can be attached to loaders and excavators. Blades move materials around the job site efficiently and can level dirt and stone. They are ideal for snow removal. Different types of blades, such as the angle, box, dozer, wood chip and others, cater to different landscaping purposes. With many available widths, they have the potential to make landscaping and lawn work infinitely easier. Brooms fit on most loader models, provide great after-project cleanup and serve as efficient, effective maintenance tools. One quick pass of the wide broom sweeps walking paths clean, as well as parking lots and other areas. In climates where it snows, brooms sweep away the snow that would be otherwise difficult to remove with just a plow or shovel. These brooms can be regular utility brooms, or specifically angled and designed for pickup. Brush cutters clear overgrowth and thick vegetation from highway medians and utility easements. 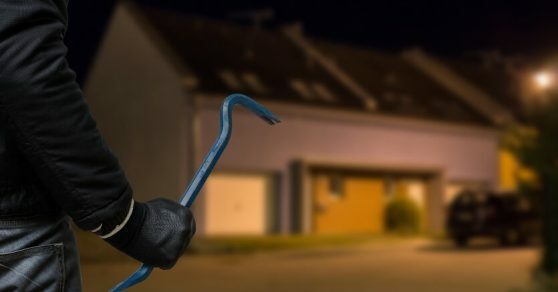 They are also a go-to tool for initial land clearings for housing, parks and recreational areas. Brush cutters are durable, fast and offer cutting widths ranging from 60 to 78 inches. Brush cutters are ideal attachments for compact wheel loaders, compact track loaders, multi-terrain loaders and skid steer loaders. Bucket attachments will also expedite work and help workers avoid back strain. Many bucket variations fit onto excavators, loaders and backhoes. Some buckets dig, grade and lift or handle mulch, while others sort rocks for drainage utilities and erosion control. Forks are suited to lift pallets up, down and around, but they can also serve other purposes. Contractors often use them to handle sod, fertilizer and decorative landscaping elements. Specialty forks, such as the ones used for blocks, construction or industrial grappling, are also available. Forks can be fitted for use on loaders, backhoes and telehandlers. Mulchers process thick undergrowth and small brush like an industrial mower would. Mulchers are great for land reclamation, foliage removal and shredding pruned materials. They can be attached to a skid steer, multi-terrain or mini loader. Rakes reap the rewards of refining soil for planting or grooming. Rakes attach to a loader to cover wide swaths at a time and remove or bring up unwanted debris, such as rocks, dirt clumps and errant vegetation, before planting. While there are industrial sizes and box-type rakes, landscape rakes range from 72 to 84 inches wide. Compactors or rollers provide the right amount of tamping for the soil to assume the proper structure. These barrel-like devices roll across the surface of the new lawn to solidify it. Most lawn experts know there’s a fine line between soil that prevents germination and soil that encourages it. Stump grinders smooth out a landscape by shaving off stumps to several inches underground. The effect is an uninterrupted planting surface. Cat stump grinders provide an advantage over tow-behind grinders because they balance their torque to work the stumps down quickly and evenly. Tillers lend a winning hand in the quest for a perfect lawn because tillage prepares the soil to accept and nourish whatever is going in it. The machines mix in fertilizer, break up existing earth, blend in soil amendments such as lime and optimize the planting surface. Trenchers help dig the ditches required for sprinklers and drainage, plus they can cut through any roots that start to grow in the wrong direction. Trenchers are also ideal for running underground wires for landscaping lighting and other electrical needs. Warren CAT makes it possible to create the perfect lawn or landscape with cost-effective, reliable and durable equipment that increases your project’s productivity and your team’s efficiency. We maintain a generous inventory of new and used machines for sale and rent. We offer full service, parts, maintenance plans and suggestions for how to acquire a combination of machines, attachments and accessories to benefit and grow your business. 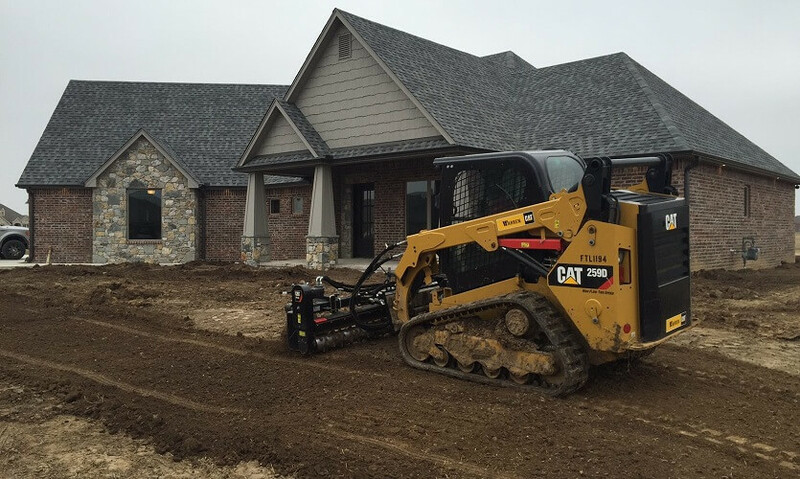 Whether you’re looking for rental landscaping equipment or new Cat landscaping equipment or used machines to buy, we’re committed to helping you find the best equipment for your project. Our professionals in each one of more than a dozen locations throughout Oklahoma and West Texas can provide information and resources. Contact us today to learn more.